Extra announcement cards for the Mola Series opened doors as we traveled! A few lovely Ecuadorian iglesias move into the spotlight for Frizztext’s story alphabet this week. In Guayaquil, this petite chapel shares a sweeping view with a lighthouse on Santa Ana Hill near the Malecon 2000 on the Guayas River. Let’s take a look! 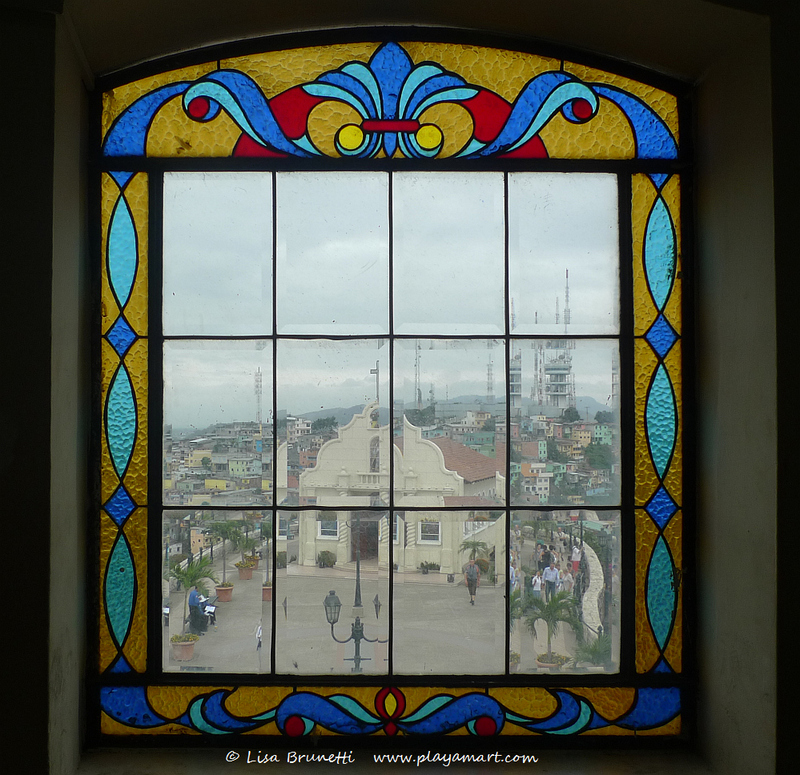 From the lighthouse staircase, lovely windows frame the view of Guayaquil. 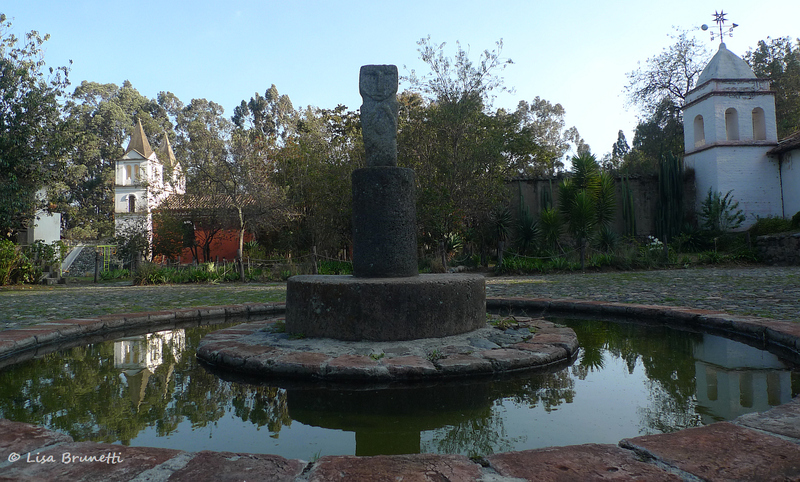 The Incan sundial stands in silent memory of long-ago cultures. 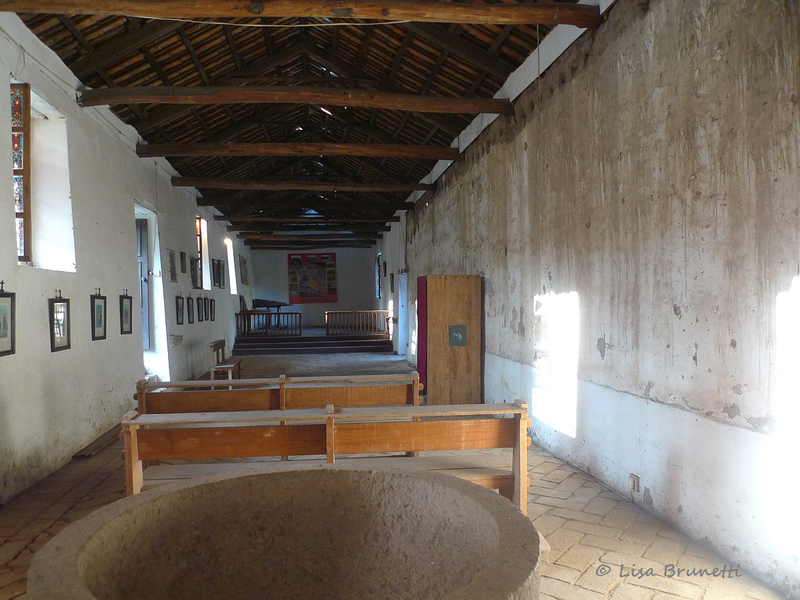 This old iglesia was built on an ancient Incan site in 1580. 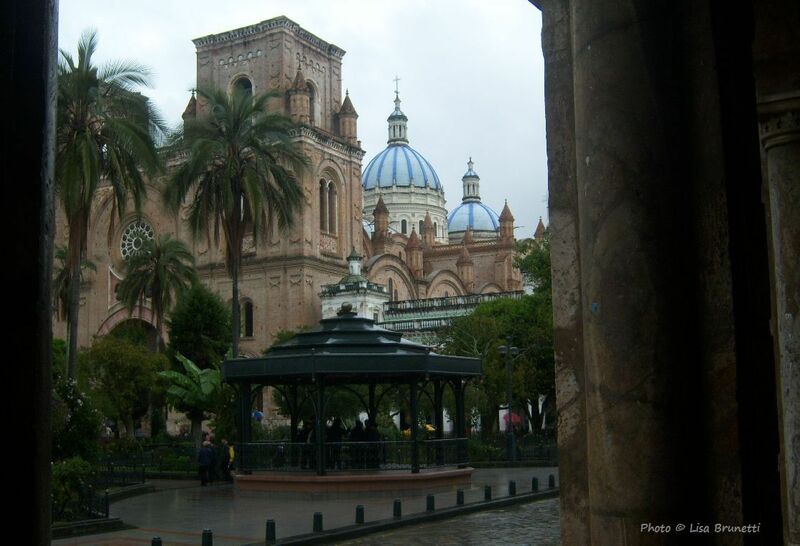 Always a well-dressed lady, Cuenca offers many parks and iglesias; the blue-domed Catedral de la Inmaculada Concepción is surely the most-photographed church in the city! Detouring away from the iglesias, this final image shows the archaeological site of Ingapirca, where the Inca and Canari Indians worshiped the sun and the moon. Pictured below is the temple of the sun. 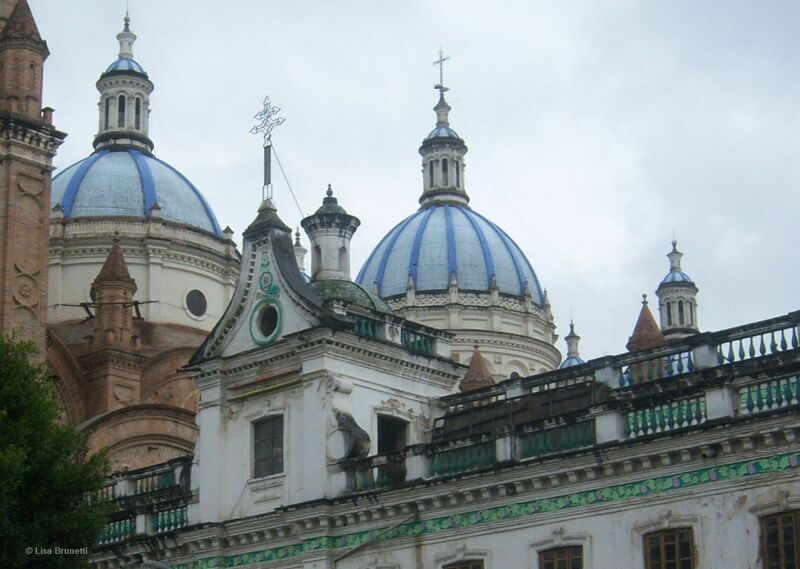 I hope you enjoyed this sampler of iglesias from Ecuador! I surely did. So much beauty and colour, and peacefulness too. I love the pink bicycle in the 9th photo. 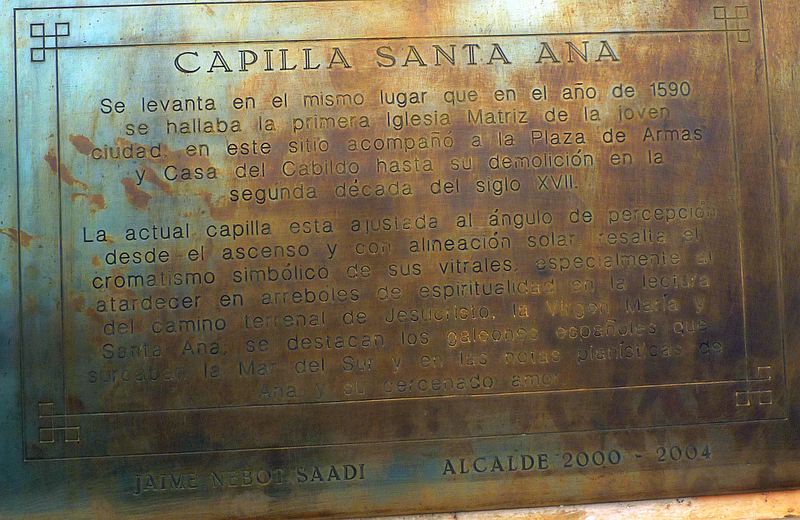 From the conquistadores, to the conquerors of the soul.. the Spanish surely left their mark! you are so right! some of those marks were positive ones and some were not so nice! great blog, love the stained glass window frame in the lighthouse..amazing ! thanks! that’s at the lighthouse near the malecon in guayaquil. one of these days you two should visit! framing the view of Guayaquil! yes, that is a great and memorable view. thanks so much for your tireless support! muchas grrrrrrrrrracias! some posts are easy, and windows are always soothing on the eyes and soul. Lovely set of photos I especially like how you have caught the reflections in the pond around the sundial. Like architecture and Guayaquil fraimed. 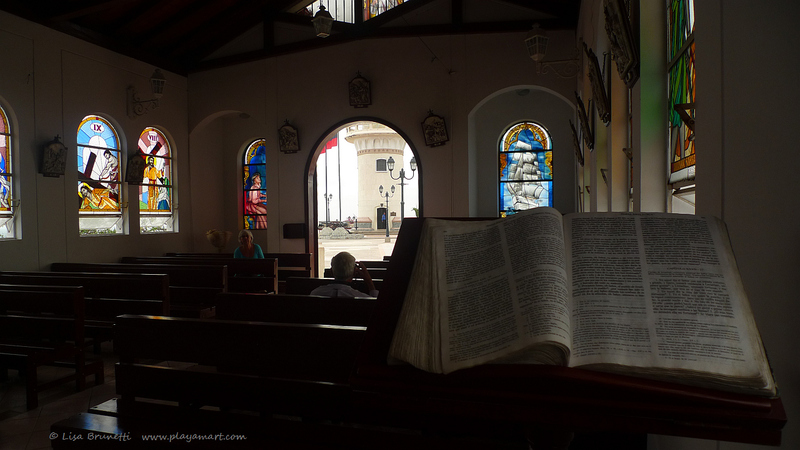 OH what a beautiful church and how LUCKY you are for geting to see it and sharing images with us! you get gold stars for your tireless enthusiasm! grrrrrrrrracias! If I stopped I would CRUMBLE!!! 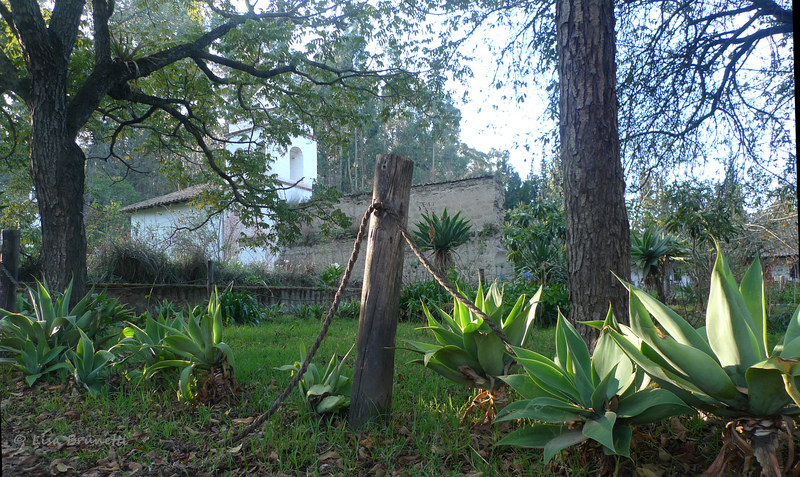 These iglesias all have their charm and history. 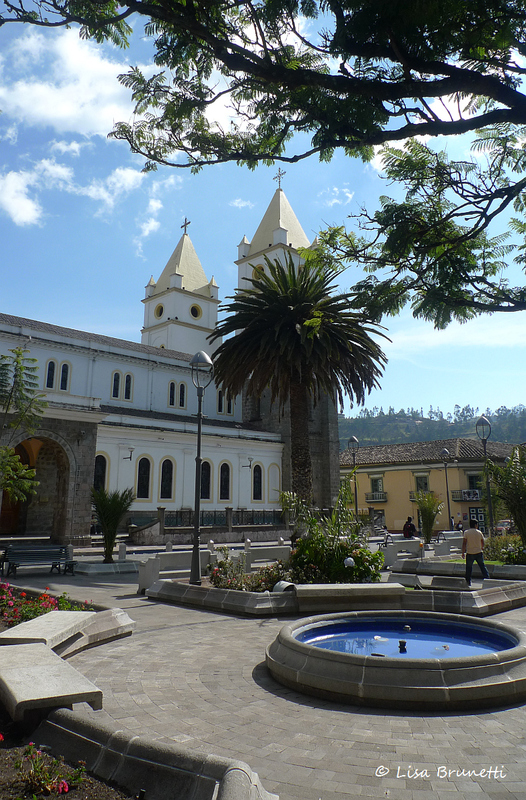 I have never been to Cuenca, but would love to visit. Your pictures beckon me back. Certainly makes me want to visit. 1580 is so old – it must be nice to stand in that place – not to mention Ingapirca. The shot of the fence post is poignant. (And who would think you could look at a church in the distance through stained glass windows?) Thank you! Lovely series. Love the picture from the glass window. Such a peaceful place. Those windows are beautiful! Great post, z! thanks! churches have a simplicity and elegance, don’t they? i’m glad you enjoyed the post. Many of the church exteriors look just like I remember from Spain. Wouldn’t know the difference if I didn’t also see the surroundings…especially the llama or alpaca or whatever it is reclining in the grass! ja! you’re right about the llamas/alpacas! spain’s influence still has a strong effect on the culture. most are proud of their lineage and history. The picture with all the colorful houses in the background – oh wow! that hill is a lovely ‘icon’ in that area, and walking through that area is quite refreshing. churches have a presence that burns through in images, but the latin ones often have an elegance and simplicity as well. Great set of photos. I find this post very interesting. Your photos always speak volumes! Thank you for brightening our days. you are so welcome, and thank YOU for your tireless support! I just love the last image. I sure did enjoy this! Stunning pictures! thanks! 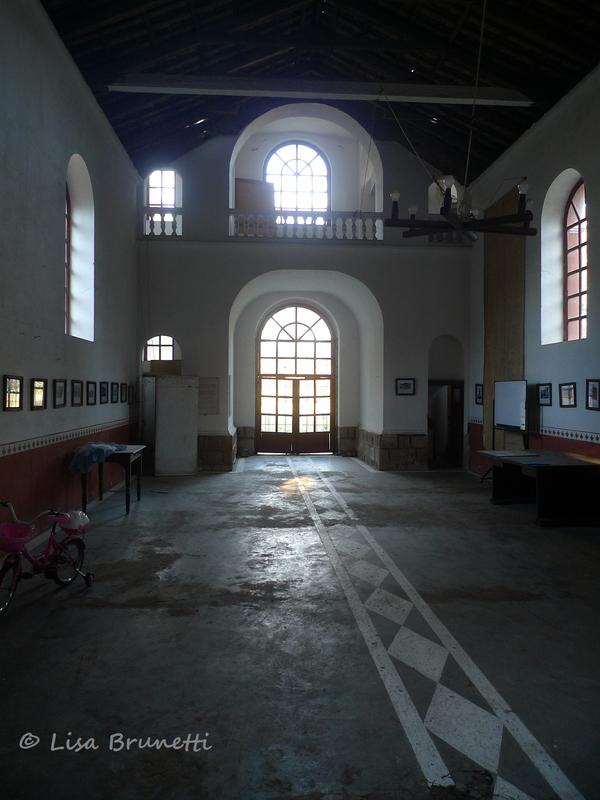 churches have their own special powers, which seep through in images. Los Iglesias hay muy bonita! Hi LIsa, wow, loved the pics! And the sun was your friend in photography that day! It’s so nice when the glow is on your side! 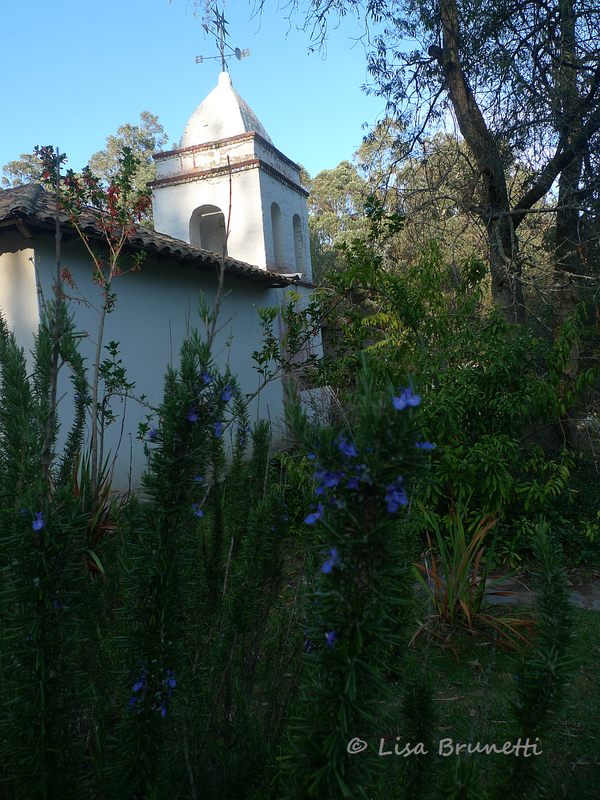 These are so beautiful and I loved the spires, architect of the Iglesias, so intriguing. Thank you for sharing…just lovely. Blessings! You always do such a nice job of showing us around, walking us through it, so we feel as if we’d seen it through our own eyes! thank you; as you know, some posts flow with little effort, and others just don’t flow well at all. the iglesia one was a breeze. The view from the window is gorgeous! And there is something calming and serene about that last shot of the temple of the Sun. thanks! 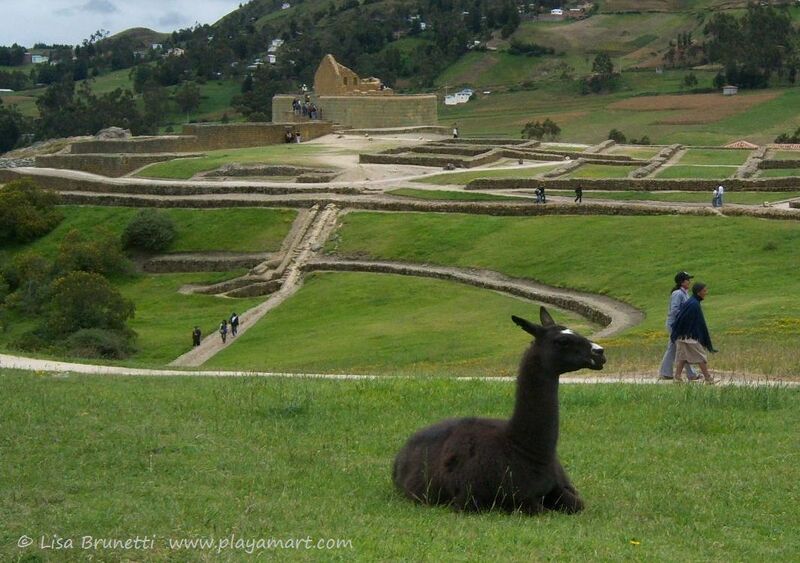 i really like that incan/preinca site of ingapirca. most of my images from that trip are lost, but i look forward to returning one of these days. Beautiful Lisa! I absolutely love the photo of the church with the city of pastel painted buildings below! thanks! that’s in guayaquil never the river and malecon. i suspect that one day your travels will bring you here!